directed Irrigation department’s staff to keep checking the water flow in Kandhesi Minor, Next day on dated 25 September 2009 I was present there with our film shooting team but Gharial got to somewhere and disappeared again. We all were helpless. 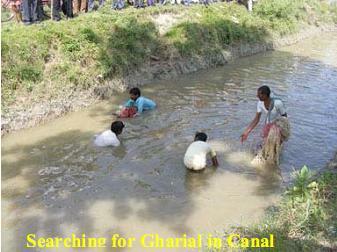 Even then we keep continuing to locate disappeared Gharial curiously. We were looking over all connecting water bodies but Gharial had gone to somewhere else. We spent more than three hours to locate but we failed to find it. had taken duties to their respective abilities. We baffled both the sides of canal with net and then we get dredging from one end to other. In the beginning we made two attempts but in vain. Thankfully, we got success in our third attempt. 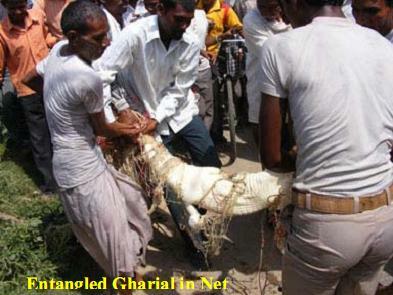 Gharial got entangled in course of dredging in net. We got it off the net with no delay. It was a 6.5 feet long female sub adult Gharial, looking pretty healthy. 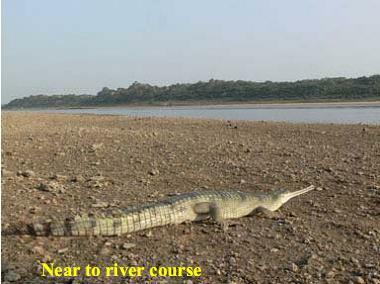 Before getting Gharial off to the National Chambal Sanctuary Nearby Udi Bridge. We also got done the medical check up of the Gharial with the help of veterinarians available at the district hospital. Our team and doctors were delighted to see all that happened to Gharial. 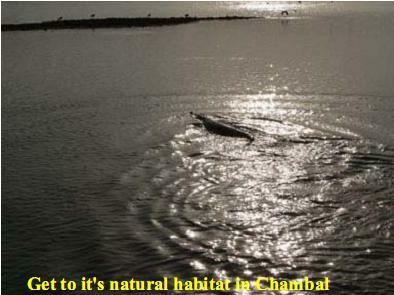 Gharial health in question was quite good to be got back to their habitat living wild in Chambal. 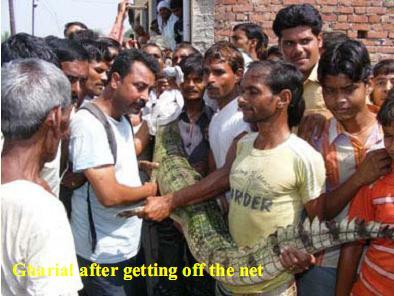 In the history of Etawah this was the first time when a Gharial sighted in the town area, thousands of people gathered around and were trying to see it first with passion. 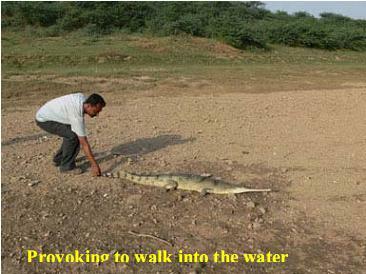 It was quite difficult to manage the situation but we all were happy to have rescued Gharial. I would say it was the long time efforts of our organisation “Society for Conservation of Nature” for making awareness of wildlife conservation that made us an opportunity to reach there in time and rescued the Gharial. We are thankful to the villagers who informed us in time and hope they would keep continuing their support for saving wildlife likewise that in future.